The Iowa Nonprofessional Permit to Carry Weapons is issued by the Sheriff of the applicant’s county of residence. The Iowa Professional Permit to Carry Weapons is issued by the Iowa Department of Public Safety. The Nonprofessional Permit to Carry Weapons is valid for five years. The Professional Permit to Carry Weapons is valid for one year. The cost for a new CCW permit is $50, a renewal permit is $25, and a duplicate permit is $25. Some Sheriffs' offices may charge an additional $5-$10 for a plastic permit card. The application processing time for a new Iowa Concealed Carry Permit is up to 30 days from the date the county receives your application. There is a 60-day window for renewing your CCW permit. A person wishing to renew their concealed carry permit must apply within 30 days before the permit expires, or within 30 days after the permit expires, otherwise a higher permit fee will be charged. Please note that while a permit can be renewed within 30 days after it expires, a person whose permit has expired should not carry in a fashion that requires a permit until the CCW renewal is complete. A denial, suspension, or revocation based solely on the results of a NICS check must be appealed to FBI NICS. Any other denial, suspension, or revocation of a concealed carry permit may be appealed to an Administrative Law Judge. Take the Official Iowa Concealed Carry Course Online! Completion of any National Rifle Association (NRA) handgun safety training course. Completion of any handgun safety training course available to the general public offered by a law enforcement agency, community college, college, private or public institution or organization, or firearms training school, utilizing instructors certified by the National Rifle Association or certain other firearms training certifying bodies (such as the Iowa Law Enforcement Academy). 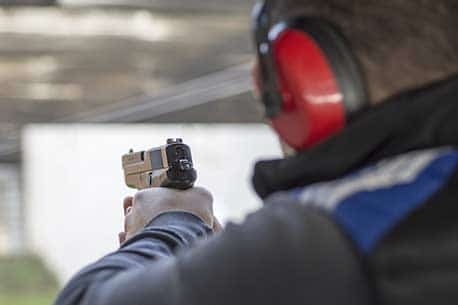 Completion of any handgun safety training course offered for security guards, investigators, special deputies, or any division or subdivision of a law enforcement or security enforcement agency approved by the Iowa Department of Public Safety. For personnel released or retired from active duty, possession of an honorable discharge or general discharge under honorable conditions. For personnel on active duty or serving in one of the national guard or reserve components of the armed forces of the United States, possession of a certificate of completion of basic training with a service record of successful completion of small arms training and qualification. Completion of a law enforcement agency firearms training course that qualifies a peace officer to carry a firearm in the normal course of the peace officer's duties. Residents may apply for a Professional Permit to Carry Weapons issued by the Commissioner of the Iowa Department of Public Safety. You must be 18 years of age or older. To obtain your Professional Weapons Permit, your need must be employment based. Residents may apply for a Professional Permit to Carry Weapons issued by the Sheriff of the applicant’s county of residence. You must be 21 years of age or older and a resident of Iowa. 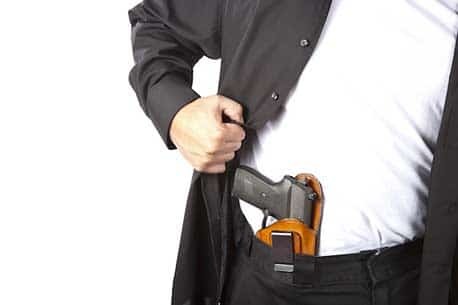 Professional permits to carry will only be issued to qualified applicants if their need to go armed is employment based and is a critical element in the protection of life and property. Applications for a Professional Permit to Carry Weapons are handled by the Iowa Department of Public Safety. nonresident correctional officers and other public officials, other than law enforcement officers, who are currently employed full time in the administration of criminal justice. other nonresidents with a demonstrable viable threat to themselves or their family as verified by a law enforcement agency in the jurisdiction where the threat occurred. This map is accurate as of October 2017. 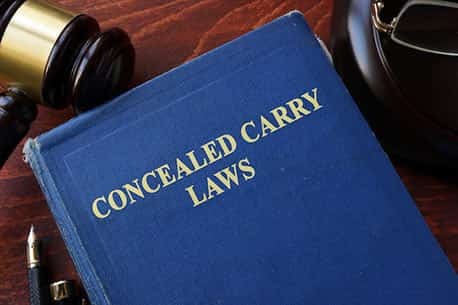 Iowa will honor any valid concealed carry permit issued by any other state and will grant all privileges to such permit holders as those granted to Iowa residents including the concealed or open carrying of a firearm. Iowa does not have CCW reciprocity agreements with states that require them. Iowa permit holders will need to check with other states' reciprocity laws to determine if their Iowa permit will be honored in that state. 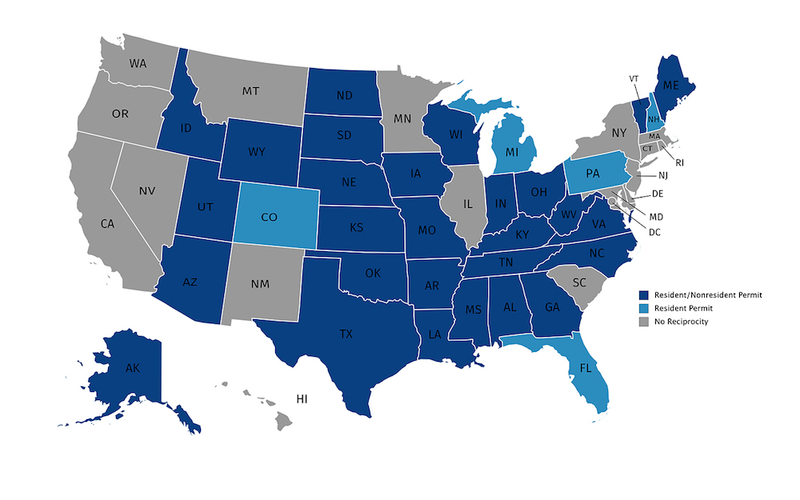 Concealed carry reciprocity maps display the states that honor a CCW permit or license from another particular state. While Iowa recognizes concealed carry permits from every other issuing state, many states have tighter reciprocity laws. If you plan on carrying in another state, make sure you validate their reciprocity laws before doing so. Iowa is a Shall-Issue State (which means, they issue concealed carry permits after established criteria are met). Iowa issues Professional and Nonprofessional Weapons Permits. Iowa Professional Weapons Permits are issued to residents and non-residents employed in situations that reasonably justifies that person is armed. Anyone with an Iowa CCW permit or other recognized concealed carry permit may legally possess a loaded firearm inside of their vehicle. If you are without a recognized permit or license, you are allowed to carry or transport an unloaded pistol or revolver in a vehicle inside a closed and fastened container or securely wrapped package. The container or package containing the handgun must be large enough that you are unable to conceal it on your person. An unloaded pistol or revolver may also be transported inside a cargo or luggage compartment where the pistol or revolver will not be readily accessible to any person riding in the vehicle or common carrier. Long guns can be transported and remain accessible as long as they are unloaded and securely wrapped. while any amount of a controlled substance is present in the person, as measured in the person’s blood or urine. Open carry is legal in Iowa but there are restrictions. No permit is required to open carry except when inside a vehicle or inside city limits. Open carry in cities is legal with an Iowa Weapons Permit, which allows for open or concealed carry. Firearms may be openly carried in vehicles only with a recognized CCW permit. Allowed with a recognized CCW permit. *In most cases, you will need a valid permit in order to legally open carry in the state of Iowa. Please refer to Iowa state law for more information on specific open carry scenarios. We try to keep the information on this page as up to date as possible, however we strongly advise that you verify this information with the Iowa Department of Public Safety. The information on this page is for informational purposes only and not for the purpose of providing legal advice. Need help? 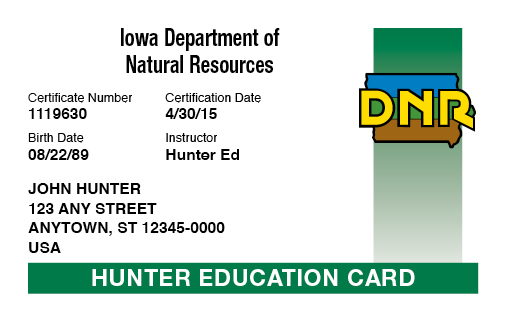 Here are the answers to the questions Iowa Hunter and Handgun students most frequently ask.